Agriculture is central to robust economic growth, development and alleviating rural poverty in Pakistan. According to a World Bank report, national average yields of major crops like wheat and rice in Pakistan are only 55% of progressive farmer yields, the highest achievable yields in the country. This inability to realize the full potential is rooted in a number of contributing factors, including: slow adoption of technology and modern practices; inefficient management; infrastructural and supply-chain bottlenecks, financing, economic and policy lapses. This modular executive certificate program is designed to provide participants with leading-edge managerial know-how and skills essential to operate successfully in an agribusiness environment. During the program the participants will gain understanding of the agribusiness economics, technological trends, and market dynamics; enabling them to recognize opportunities and create value for their businesses and respective organisations. Acquire management knowledge, tools and techniques useful in making sound business decisions. Field visits and interactions with agribusiness experts is an intgral part of ECAM program, providing a good blend between theory and practice of agribusiness management. 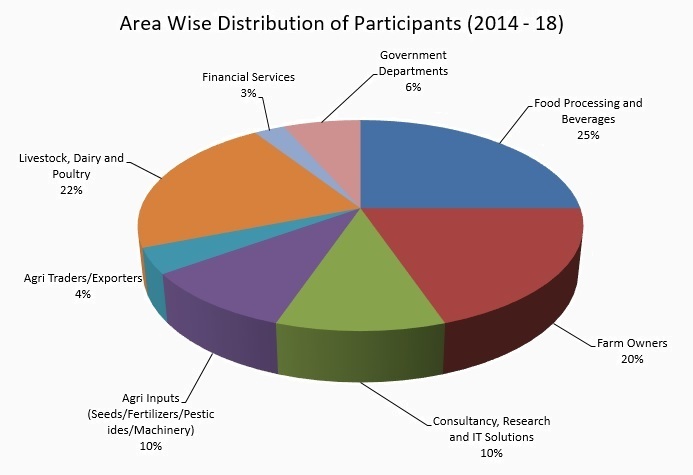 below are few examples of field visits of the ECAM participants during 2014 - 18. One of the key features of the program is speaker sessions with leading industry experts, policy makers and agribusiness leaders and senior executives from diverse business segments. Agribusiness managers, processors, producers, providers of agri-credit, farm managers and others involved at various stages of the agricultural produce value chain. Professionals of life sciences, food sciences, researchers at private and government institutions related to agriculture who desire to acquire cutting-edge business knowledge relevant to agribusiness. The program is specifically designed to meet the needs of working professionals; the alternate weekend structure of the program allows the participants to hold their full-time jobs. A minimum educational qualification of a bachelor’s degree and atleast 2 years of experience is required for participation. ECAM program participants have included executives from various agribusiness segments, agri entrepreneurs, farm owners, and others involved in the agribusiness value chains. Diversity of program participants brings together enormous experiences and agribusiness knowledge, creating an enriching learning environment and networking opportunity. Participant diversity is a distinctive strength of the ECAM program. Accommodation is arranged on request and as per availability at Rausing Executive Development Centre. The residential fee for participant's stay at REDC-LUMS is PKR 9,000 per night for participant (inclusive of breakfast and dinner). You are, however, requested to inform us of the time of your arrival and departure. Our preferred mode of payment is by cheque/banker’s draft payable to Lahore University of Management Sciences. Note: REDC may cancel or postpone a program. In this case, university will refund registration fee but will not be responsible for any other related charges/expenses including cancellation/change charges by airline and travel agencies. Mr. Haroon Tahir - Angro Hub (Pvt.) Ltd.